COMMENTARY ON "Old Testament Faith"
This week’s lesson looks at Paul’s reference to Abraham in Galatians 3 as the central example of faith in the Old Testament. The author correctly points out that Abraham’s obedience was not the reason God counted him righteous. Rather…the author says that it was Abraham’s faith “counted…to him for righteousness”. It is true that Abraham was saved because of his faith, but the Bible actually doesn’t say that Abraham was saved by faith; rather, it says he was counted righteous because he BELIEVED GOD. It might seem nit-picky, a matter of mere semantics. Words matter, however, and context is everything. If we talk about “faith” as being the crucial factor in being saved, that word must be defined. Faith in what? Does it matter that Scripture says Abraham “believed God, and it was counted to him for righteousness” instead of saying saying, “Abraham had faith, and it was counted to him for righteousness”? Abraham was not saved by his faith, nor does Scripture say God counted his faith as righteousness. Rather, Abraham was counted righteous because he believed God. Faith can be placed in anything, but even faith in God is not the means of being saved or counted righteous. Faith in God can simply mean we believe He exists, that He’s the creator, that He that He answers prayer, and so on. Further, “faith” without identifying an object might be simply faith in something such as prayer, or the fact that the sun will rise tomorrow. What Scripture says is far more specific and distinct: Abraham believed God. In context, what did he believe related to God? He believed that what He said would come true, even though there was absolutely no physical evidence to confirm the promises. He believed that God would give him seed as plentiful than the stars and the sand; he believed God would give him the land in which he stood, and he believed that God would bless him and bless nations through him. He believed that God would do something that did not yet exist. He believed God’s words, the literal, actual words of His promise because he believed God. This distinction is important, because when people with a worldview built by an extra-biblical “prophet” hear the word “faith”, it is not immediately clear what that faith is, or what its object is. Furthermore, it is important because God does not count us righteous because of our FAITH. He counts us righteous for BELIEVING what He says, for believing that what He has said in His word is true and that what He has done is absolute. The lesson is correct that salvation has absolutely nothing to do with what we do, but it is crucially important that we understand what Scripture actually says. Even so Abraham BELIEVED GOD, AND IT WAS RECKONED TO HIM AS RIGHTEOUSNESS. Therefore, be sure that it is those who are of faith who are sons of Abraham. Belief and faith are related. As Ephesians 2:8 says, salvation is “by grace through faith, which is a gift of God.” Salvation is ENTIRELY the work of God, an act of grace, and He gives us the faith to believe. It is vital, however, to understand that it is belief in God’s words to us that is what God credits to us as righteousness. In fact, Paul’s point which he is developing is that even gentiles, who do NOT keep the law, are Abraham’s children when they believe God and receive believing faith by God’s grace. Abraham believed God, and that belief was counted to him as righteousness. God’s words—how do they come to us? Second, God’s promises increased in specificity over time, and the reader is asked what Abraham’s experience reveals about counting revelation. Third, Abraham sometimes failed to act in faith on God’s impossible promises, yet we can take courage from from Abraham and “keep returning to faith”. In your spiritual community, do you spend enough time sharing about individual faith journeys? What methods can be used to affirm and encourage each other to engage more directly with God in a relationship of faith? And here—in this application of Paul’s original use of the Abraham as the model of believing faith without works of the law, the lesson goes wildly off course. Abraham’s hearing from God through words, appearances, and visions is not prescriptive for Christians. The account of Abraham is a factual telling of what happened, but Abraham had no written Scriptures. God spoke to him directly because that was the way God interacted with His people at that time. It was no less easy for Abraham to believe God, however, than it is for us. How on earth was Abraham, who WAS a moon worshiper, to know or believe the voice of the one true God? God had to awaken faith for Abraham to believe, just as He does for us. Today, however, we have God’s own words to us. If we do not believe or act on His revealed word, why would we believe or act on a revelation or vision? Adventism must accept “visions” as authoritative because Ellen White received visions and dreams. Yet Scripture asks us to believe every word out of God’s mouth—and those words are found in the Bible. We are never instructed to go beyond Scripture and prayer to “hear from God”. If we do, we have absolutely no way to evaluate what we hear. What makes one person’s “revelation” more authoritative than another’s? What if two people have contradictory visions? How does one decide which is true? Furthermore, is someone claims to have an impression or revelation or word from the Lord, should that word be binding on MY conscience? How am I to know? Scripture is our plumb line. God will not bypass His word to give us “words”. Abraham believed God—the actual, very words God spoke to him—and he believed them because he believed GOD. He knew God was speaking to him because God revealed Himself and gave him the faith to believe. It is dangerous and even heretical to encourage people to seek the voice of God in their hearts and minds. God’s word is clear, and the truth of His revelation is something many people do not want to embrace. Yet they are eager to “hear from God”. The spiritual-sounding words here are not Christianity. They are not biblically-based. This method of attempting to hear from God is much closer to the new age or to eastern mysticism. Even if God were to give someone a direct revelation, it would never go beyond or deviate from Scripture. Intuition and cultural interpretation has not place in hearing from God. God’s word is His revelation to us, and it reveals His Son who became sin for us and died in our place, rising on the third day and destroying the curse of death. Finally, this lesson again misses the gospel. We are born spiritually dead; our real, immaterial spirits which are separate from our bodies, are naturally dead in sin. When we hear the gospel of our salvation, that Jesus died for our sin and was buried and then rose on the third day, we are commanded to believe. When we believe, we are transferred at that moment out of the domain of darkness into the kingdom of the beloved Son (Col. :13), and we pass from death to life (Jn. 5:24). These words are not metaphors; they are the living truth from God’s living word, and they are true at the moment we believe, not eventually when Jesus returns. We are born again when we believe, and we are made alive at that moment. Abraham is a model of those who hear the word of God and believe by His grace through the faith which He gives us. 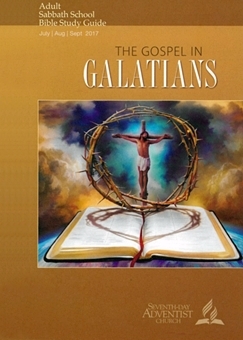 Dear reader, do not miss what Paul is teaching in Galatians. He is saying that if we insist on keeping the law—any of it—we fall from grace. The children of Abraham are those who believe God WITHOUT the law and are born again. Old Testament Faith and New Testament Faith are exactly the same: those who believe God—His very words—will find that their belief is counted to them for righteousness. God is faithful, and His words cannot fail. Copyright 2017 BibleStudiesForAdventists.com. All rights reserved. Revised July 21, 2017. This website is published by Life Assurance Ministries, Camp Verde, Arizona, USA, the publisher of Proclamation! Magazine. Contact email: BibleStudiesForAdventists@gmail.com.